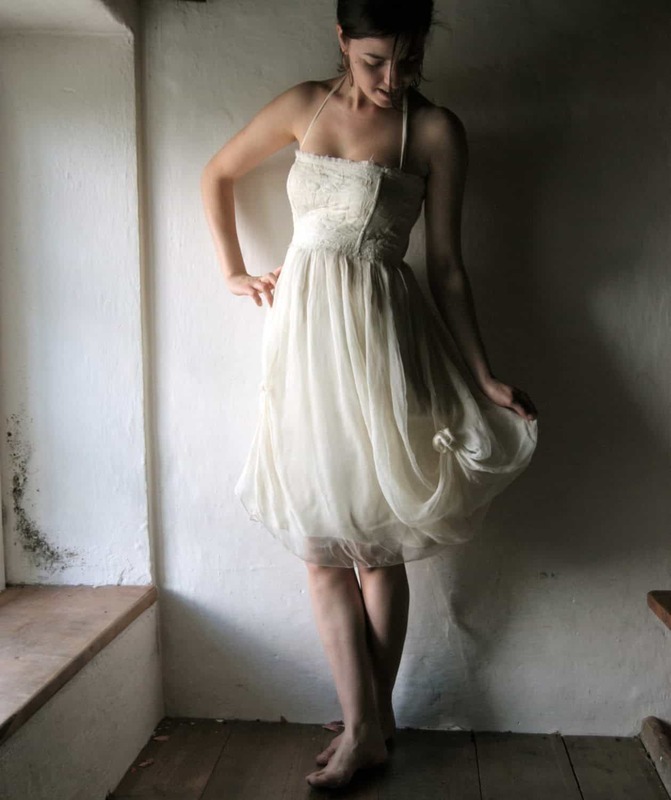 A short and feminine bohemian wedding dress, perfect for an easygoing bride who is looking for something flirty and fun. The bodice is made by stitching together multiple layers of silk and lace, creating an entirely new textile, of great depth and texture, that is soft and malleable, yet holds it’s shape extremely well. The bodice is fully boned and closes with a wide corset lace-up, which is highly adjustable, providing a stress-free fitting experience. The dress has silk chiffon halter straps for extra support, but you have the option of not wearing them, as they are not necessary for suppor. They’re super light and can simply be tucked into the bodice. The airy skirt is made of three layers of high quality Italian silk: the top layer is draped to one side and decorated with small gathers that look like flowers. It has a slightly asymmetrical hem, longer in the back, that gives extra movement and flare to the whole dress. There is also a long version of this dress, the Amaryllis. The dress was beautiful and perfect for my outdoor wedding. The material wrinkles easily, so keep in mind that you'll have to get it steamed once it arrives. Also, keep in mind that the shipping policy doesn't apply to bridal orders (it doesn't say that in the policy, but it takes longer than the stated shipping time for bridal orders). I'm not deducting a star for that, because maria made an exception for me and sent the dress in time for my wedding, but I want to prevent other brides from stressing out. Just don't order the dress last-minute like I did, and you'll be fine. Beautiful dress, and made quickly! I can't wait to wear it. Gracias gracias gracias!!! The dress is perfect!!!! I can't wait to wear it! The delivery was super fast! !